Juventas New Music Ensemble gave the opening performance of their 2011 Opera Project, Light and Power, on Thursday evening, May 19, at the Cambridge YMCA Theater in Cambridge. The full length, two-act opera takes an interesting spin on the story of Nikola Tesla and his interactions with Thomas Edison, Henry Ford, and George Westinghouse. What makes the narrative really effective is how the story, told in reverie as Tesla’s lab is burning down, shifts between his own interpretations of his contemporaries and a bizarre, science-fiction-esque internal dialog with Nova, a “cyborgian hive queen” (as described by librettist Jillian Burcar and presumably meaning a merger of human and technology). One of the really refreshing elements about this production was that, unlike what seems to be the norm of many modern operas, the breaking of time and the shifting between reality and abstraction was handled with a careful sense of clarity. The collaboration between Burcar and composer Isaac Schankler was very evident; one got the sense that the entire production was bound to a unified vision. This is no easy feat for operas that have been produced hundreds of times, let alone a world premiere. Schankler’s music is extraordinarily eclectic – where traditional operatic roles may have themes or motifs associated with characters, Schenkler attached entire musical idioms to them. 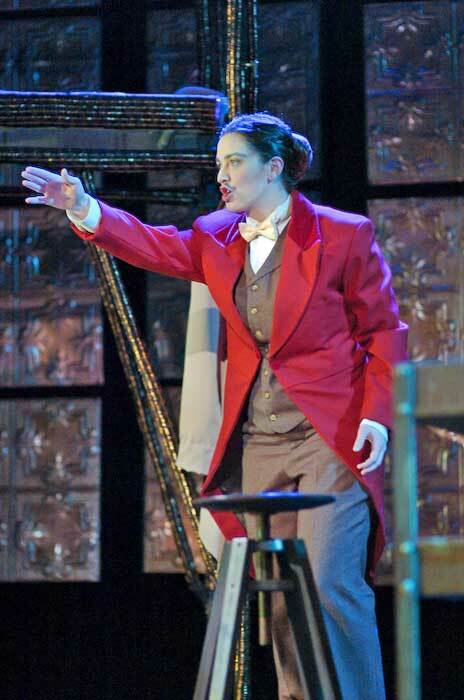 The mystical Nova character (Christine Teeters, soprano) is given some spectralist qualities to her music, while the idiom for Edison (Davron Monroe, tenor) leaped into ragtime. All of the music was masterfully composed. The divergences of styles were effectively informed by both the tradition of opera and the tradition of the American musical. The use of electronics, varied and sensitive, was always complementary to the musical drama. There were also more than a few musical surprises: interesting uses of musical shifting between disarray and uniformity, as well as “phasing” in the chorus parts. Other highlights (which may also have been under the influence of Steve Reich) were scenes where the instruments mimicked the actors’ speech patterns. It was very effective with Barratt Park’s presidential speech, less so with Henry Ford’s character later in the act. The performances of Chelsea Beatty and Christine Teeters played off each other extremely well. Beatty’s performance was a well-rounded package – her quality vocal performance was enhanced by a captivating stage presence and convincing body language – whereas Teeters’s enrapturing, powerful voice alone was simply a show stealer: as much of a spectacle as were her and her Chorus of Bees’s outlandish costumes. Monroe portrayed Edison with wry charisma, complemented by the contrastingly shy character of Ford, played by Rachel Selan. 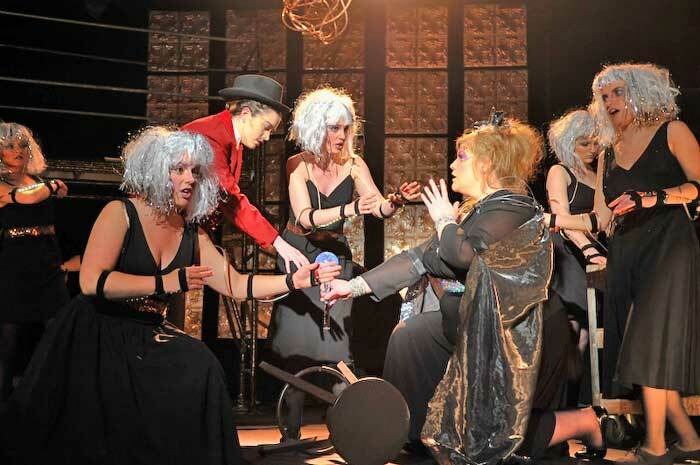 The chorus and the pit, under the direction of Lidiya Yankovskaya, also deserve special commendation. What is perhaps most impressive about this entire production is the scope. While there were not any substantial set changes in the opera and the staging was confined to a relatively limited space, the costumes, set, lighting, and stage direction were all quite elaborate. With the recent emergence of a handful of low-budget, grassroots-based opera companies in the area, one can justifiably question the ability of a contemporary music chamber ensemble to successfully take on such a monumental project. Juventas’s success is undoubtedly by virtue of the dozens of production staff members, many who volunteer, that have a passion about what they are doing. It is comforting to know that there are not only outlets for the premiering of new operatic works, but that there’s a receptive and enthusiastic base of supporters to bring these works to life with quality and authenticity. Light and Power will be running at the Cambridge YMCA Theater all weekend. Well done review with which I agree wholeheartedly, having seen the Saturday night performance. One minor correction is that the composer’s name is Schankler, not Schenkler. I’ll heartily second George. I went on Sunday. The large audience was very enthusiastic.